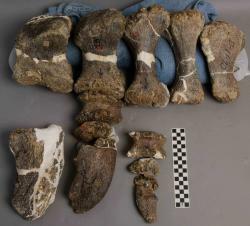 Dino foot: These fossilized bones make up the foot of a large dinosaur.Courtesy SMMfoot of a Haplocanthosaurus dinosaur. Discovered by Science Museum of Minnesota researchers on July 14, 1990, at the Poison Creek Quarry, Wyo., in the Morrison Formation. The rest of Haplocanthosaurus: This drawing gives the rest of the shape and size of Haplocanthosaurus.Courtesy SMMHow would you like to go shopping for shoes for this dinosaur foot? This rear left foot belonged to Haplocanthosaurus – the “simple spined lizard” – a rare, smaller sauropod dinosaur. A Science Museum of Minnesota research team found this specimen in 1990 at the Poison Creek Quarry in Wyoming. This long-necked dinosaur needed big feet to hold up its huge body, which could grow to more than 60 feet long and weigh about 15 tons. Can you make out the five individual toes? You can see the toes and claws are numbered to make sure they get matched up in the right order back in the lab. Haplocanthosauruses are a rare find, having only been found in three locations in the U.S. west. The most complete Haplocanthosaurus is on display at the Cleveland Museum of Natural History. Click here to see that mount and learn more about this unique sauropod. Do you have a comment or question about this dinosaur? Feeling creative? Write your own object label for this big dino foot in the comments area to share with other museum visitors.